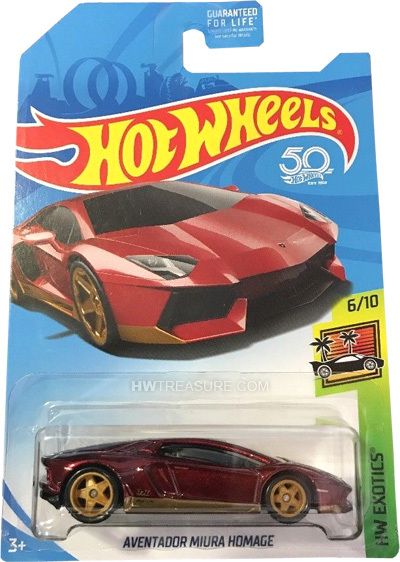 FKB50 is part of the 2018 Super Treasure Hunt set and 6/10 in the HW Exotics series. It is Spectraflame burgundy with gold rocker panels. 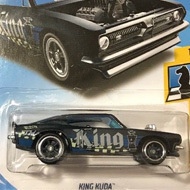 “TH” is on the sides by the rear wheels and the Lamborghini emblem is on the nose. The car has tinted windows, a gray interior, gold Real Rider Exotic wheels, and a black plastic Malaysia base. 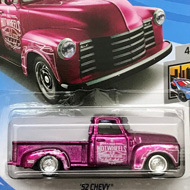 This vehicle can be found in mix “K” of 2018 Hot Wheels mainline cases. The Lamborghini Aventador LP 700-4 made its debut in the 2012 New Models series. The sports car is named after a bull who fought in the bull ring of Zaragoza, Spain in 1993.